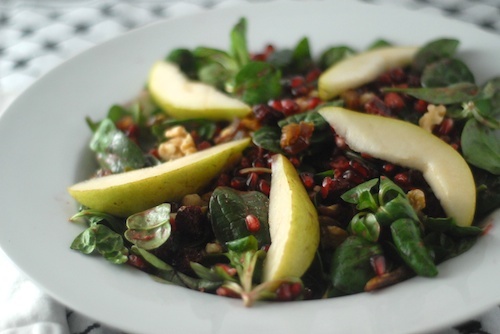 Walnuts, dried cranberries and dates, and fresh pear and pomegranate stud this pretty red and green salad. With all the fruit and nuts atop its bed of maché and baby spinach it almost qualifies as dessert. The dates make a soft, sweet counterpoint to the crunchy, tart pomegranate arils. This recipe is a riff on Katherine Martinelli’s fruit, nut, and goat cheese salad. Lately I’ve discovered the soft, mild green maché which mixes well into any salad. Trader Joe’s sells it bagged, which makes it affordable and convenient enough that I sense a maché salad jag coming on. Use whatever greens you have handy: for my salad I mixed maché with baby spinach. Dress it with pomegranate vinaigrette made with fresh pomegranate arils. This recipe has a lot of ‘topping’ for the amount of greens and is quite filling. If you prefer a lighter hand with the dried fruits and nuts, go ahead, it’s up to you. Not quite a full dinner, but the variety of fruits in this salad make it a filling one. The red pomegranate and cranberries are beautiful against the dark greens. 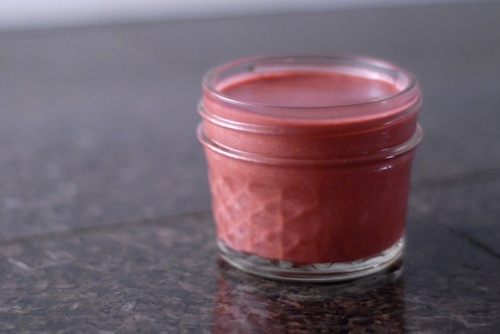 Prepare pomegranate vinaigrette. See previous post for ingredients and directions. You'll need one jumbo or two average pomegranates to make both the dressing and the salad. Cut the pomegranate(s) partway open, rip apart, and remove arils. Chop the dates. They will stick together a little, but you can pull them apart when it's time to dress the salad. Chop walnuts into large pieces. Wash and dry greens, shred if needed, place into large bowl. Serve dressed greens onto large dinner plates. 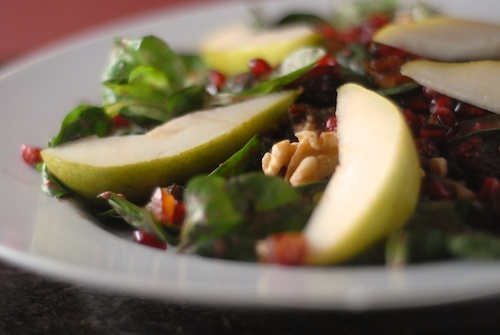 Sprinkle each salad with dates, walnuts, cranberries, pomegranate seeds. Core pears and cut into thin wedges. Arrange pears in a star on top of each salad. Prep time does not include dressing, which takes an additional 15 minutes. If you try this salad, let me know how you like it in the comments below. I love hearing from my readers! 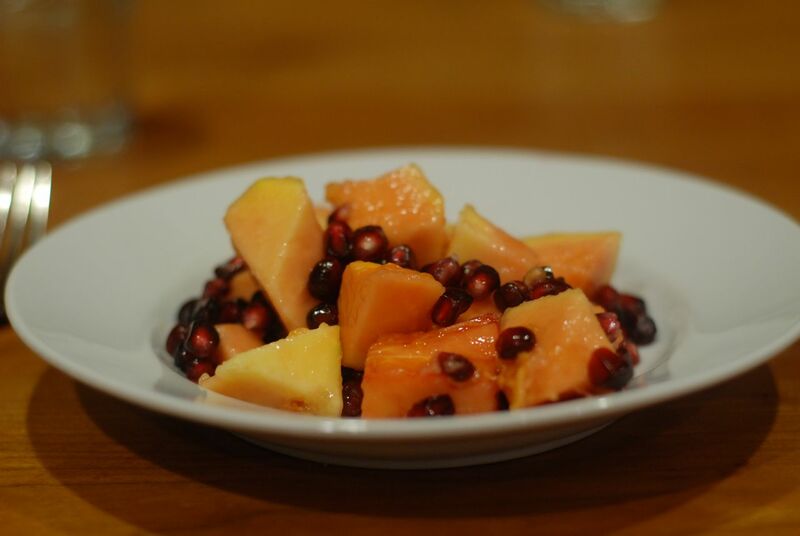 Papaya Pomegranate Salad A simple yet great salad combination, perfect for a winter salad: red papaya and pomegranate. Pomegranate Salad Dressing A tangy, sweet pomegranate salad dressing that's nice and thick and coats salad greens well. 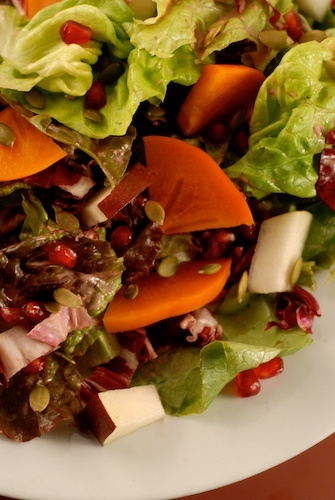 Winter Reds Salad with Pomegranate Dressing A festive red, green, and orange winter salad with pomegranate seeds and dressing, Fuyu persimmon, red pear, and greens. 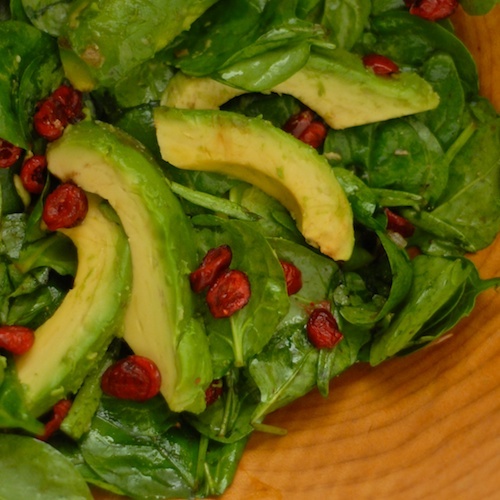 Baby Spinach Salad with Dried Cranberries, Avocado, and Shallot Dressing A pretty red and green salad with avocado slices, dried cranberries, and baby spinach, finished with a shallot dressing. Thank you Mary for visiting my blog and it’s a please to discover yours. I love this salad and have made a similar one using pomoegranate. Pomegranate is a lovely addition to vinaigrettes. Thanks for pinning my chocolates on Pinterest. Please let me know what you think about them when you make them. Coconut butter would be a great addition. I can see we both love pomegranate, I will definitely comment about your pomegranate chocolates when I try them! I love pomegranate arils in salads. They’re a lot of work to extract, but so worth it–they have the ability to perk up just about anything! This salad looks beautiful! Thanks, Ohkeeka! I love pomegranate arils in salads, too, so does my son, he’ll eat the whole salad if I sprinkle pomegranate seeds on it. Thanks, Susan! I agree that you wouldn’t need much to make this a dinner. A seeded baguette would make a nice accompaniment. You could also add a little cheese or something else with protein to the salad. I prefer the lighter hand, the one with the dried fruits and nuts.I tried the salad, my family loved it especially because of the chopped Medjool dates.I enjoyed preparing the Winter Jewel Salad . I’m glad you enjoyed it Barhi. Thanks for weighing in.